Zachary Kinkade limited edition giclée on canvas:"Beyond the Farthest Star"
Zachary Thomas Kinkade, Thomas Kinkade's nephew, was born in 1992 and has been passionate about art his entire life. Beginning when he was 11, Zachary began entering and winning national and regional art competitions and shows. Deciding that art was his calling, Zac submitted a portfolio to the Fort Worth Academy of Fine Art and was accepted to the school in preparation of formal university training in the arts. During this time, Zac also attended Tarrant County College to study art and most significantly began working with his "Uncle Thom" and apprenticing at the Thomas Kinkade Studios to explore his own aesthetic vision. 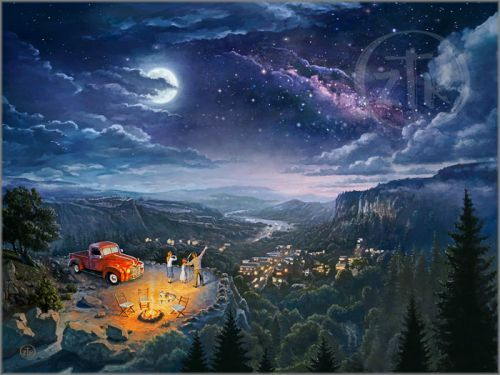 Zac Kinkade continued these relationships while attending Cornell University in Ithaca, New York, where he eventually graduated with honors from that academy's prestigious School of Art and Architecture. During the summers in Ithaca, he illustrated for the underground magazine Kitch and in his junior year was recognized by the Le Bal Gallery in France where his conceptual works on the theme of "War and Beauty" were accepted for inclusion into their prestigious annual publication La Topographies La Gurre. Again, following in his uncle's footsteps and in service of his own life as a painter, Zac now attends Art Center School of Design in Pasadena studying as his Uncle before him in this internationally known and highly ranked University. Zac has taken a position as a resident artist in the Thomas Kinkade Studios and will add his hand toward finishing the work and vison of his uncle and mentor, Thomas Kinkade, all the while creating his own legacy with pencil and brush.